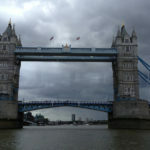 Hear we go again! Another Star Wars movies was recently released. Yes Disney’s Han Solo movie is a Star Wars story, meaning it’s not part of any of the Star Wars trilogies. Instead it’s a stand alone movie designed to enhance or explain the major characters or story lines. In this case Han Solo’s beginings. We all wondered about his early years before he joined up with the Rebel Alliance, didn’t we? Regardless if you had the burning desire to learn more about Han or not one thing is certain the new movie has renewed interest on all that is Star Wars. 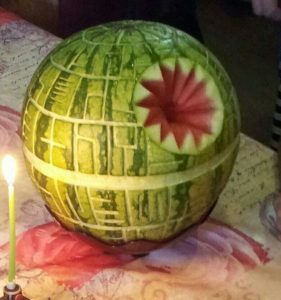 This means more Star Wars themed parties and events which need of course Star Wars inspired recipes! 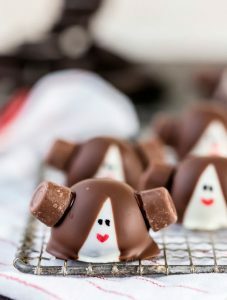 These Star Wars inspired recipes are super cute and mostly fairly easy to make. It might just make you the super cool parent of the year when you roll them out at your kid’s Star Wars themed birthday party! 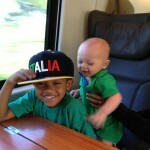 Ok I couldn’t resist so I posted this jello picture I found on Pinterest twice. After it is the Han Solo movie and the most memorable thing that ever happened to Mr. Solo, at least in my book, was when he was entombed in carbonite by none other than Darth Vader at the end of episode V The Empire Strikes Back. I’m sure exactly which site has the recipe for this jello, but do you really need one? 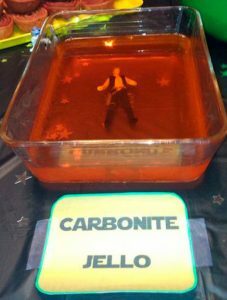 All you need is a box or two of jello and a Han Solo action figure. Place him at the bottom of the pan and follow the directions on the jello package. Pour the jello over the man and let it gel! Personally I’d use green jello simply because I like lime jello. 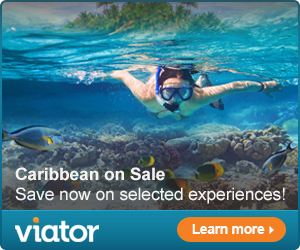 But we all know carbonite is gray and I don’t think there’s gray jello, maybe you can use blue. Or if you’re really inspired use Knox unflavored jello, add fruit juice and a few drops of black food coloring, you could possibly end up with gray colored gelatin. It might work. But me I’d stick with green lime jello. 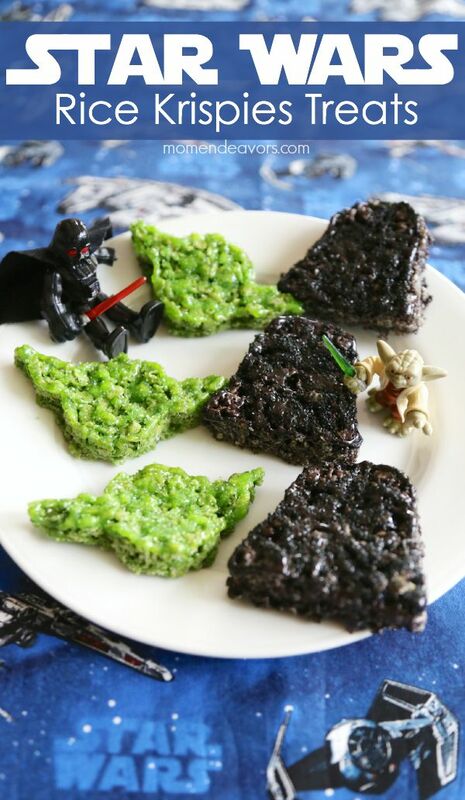 Another Star Wars inspired recipe that doesn’t really need a recipe. The picture says it all. 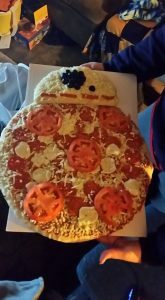 Arrange toppings on a homemade or frozen pizza to make BB8, use a half a pizza crust topped with tomato slices and olives for his head. Use your imagination and turn pizzas into the Death Star or planets! If you want to get creative shape the dough into your favorite Star Wars character, Yoda, R2D2, C3pO, Darth Vader, Chewbaca, or whoever. Remember shape the dough, spread with sauce, sprinkle with cheese, add toppings, and bake. 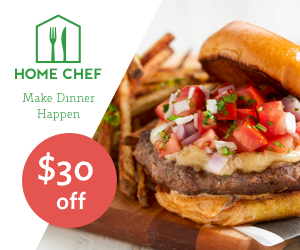 You can even use refrigerated or frozen pizza dough! 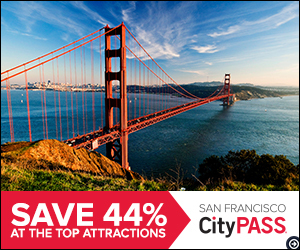 Prefer quesadillas to pizza? 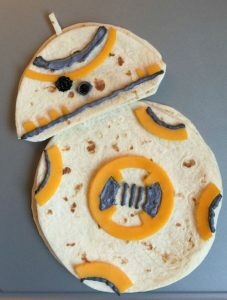 Never fear here’s a recipe from Totally the Bomb for this BB8 Quesadilla using cheese and colored cream cheese. I think everyone loves rice krispy treats. They’re a great snack and they’re pretty easy to make. Here’s the recipe and directions from Yummy Mummy Club! They use food writer pens to make the faces on marshmallows. 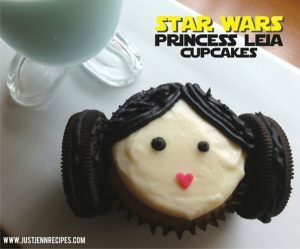 Paintbrushes and Popsicles has an awesome recipe for Leia Cupcakes! This one’s probably the hardest to make if you’re going to make macaroons at home. 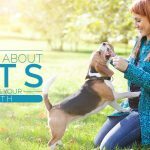 I’m not that patient! But you can use store bought macaroons. 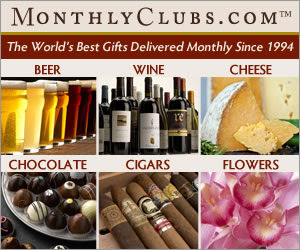 (I get a box of frozen ones from Sam’s Club or Costco, they’re pretty inexpensive). If you use store bought macaroons then all you need is a steady hand. 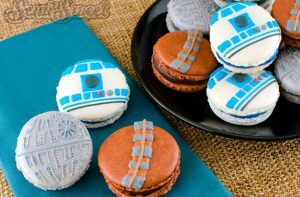 Just pipe the colored icings on the macaroons to make R2Dc, the Death Star, or Chewbacca. Ok this one takes skill, carving skills that is! Find yourself a round watermelon and get out the carving knives! 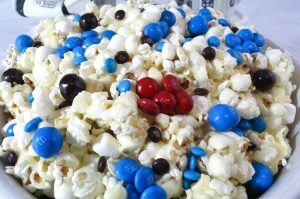 Two Sisters Crafting makes this yummy popcorn. 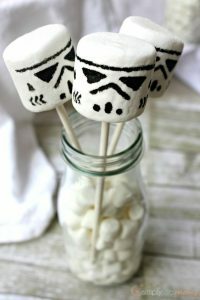 Awesome snack for that Star Wars Movie Marathon! No Star Wars themed party or movie night would be complete without lightsabers. 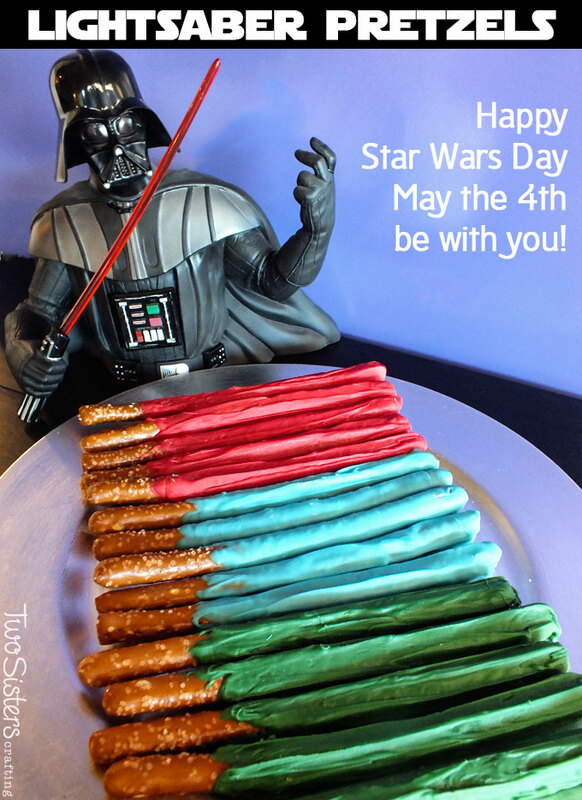 How about these Lightsaber Pretzel rods from Two Sisters Crafting? 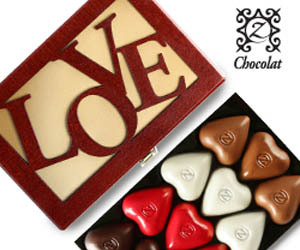 Hey they’d make awesome party favors if wrapped in clear treat bags! Need some Star Wars inspired party stationary and decor? Contact Savvy Nana Crafts, they’ll design the perfect invitations, favor tags, banners, and signs for your Star Wars themed event! 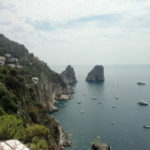 Capri Shore Excursion on Your Own! 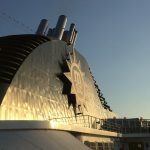 MSC Lirica Review – Would I Sail Her Again?